We have studied that Reality or Sachchidananda is a triune of Existence-Consciousness-Bliss, We have also mentioned that these are not additive terms but different poises of the same Reality. In Chapter X of the Life Divine, Sri Aurobindo modifies the nature of Sachchidananda by introducing the dimension of Force (or Shakti or Tapas) as an integral aspect of the Absolute Consciousness. Consciousness (Chit) is not merely consciousness or awareness but a ‘complex’ of ‘Consciousness-Force’ or ‘Chit-Shakti’. ‘Force’ is as inseparable from consciousness as is the power of fire from fire. Sri Aurobindo explains that the manifestation of consciousness through creation is possible because of the presence of the Force or Shakti, otherwise the Absolute Consciousness (which mystics perceive as ‘pure’ consciousness or Chit) would have remained in its poise of indivisibility and immobility. This chapter also provides a definition of consciousness that would be equally relevant to the different types of consciousness researchers—psychologists, physicists, mathematicians, and metaphysicians. At the scientific level, there are two major approaches in consciousness research. The first approach starts from neurophysiology and extends to psychology. The second approach starts from the physicist’s level of matter-energy and uses different models to understand both the physical and non-physical qualia of consciousness. Both the approaches have helped to throw some light on how consciousness acts but both have failed to reveal the true nature of consciousness. 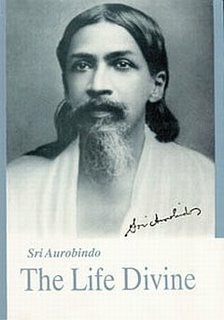 The limitations of these approaches were previsioned in the second decade of the last century when Sri Aurobindo wrote that our ordinary understanding of a ‘mental waking consciousness’ when one is ‘not asleep, stunned or otherwise deprived of his physical and superficial methods of sensation’ (The Life Divine, pg 94) was too limited to be generalized and too simplified to be relevant. Actually, data from research of these three dimensions have resulted in such intriguing observations that our hypotheses of consciousness need constant reconstructions. Sleep cannot be today considered as ‘unconscious’ .In fact, sleep is now considered to be an active physiological process and not a mere failure of arousal and is clearly separable from stupor (a situation where a subject can only be ‘aroused’ by vigorous and continuous external stimulation) and coma (a situation where a subject elicits no response to any external stimulus or inner biological need). As sleep is not a failure of arousal, it is not surprising that we experience a rich and variegated dream-life that reveals the personal and collective unconscious. Dreams also at times carry future premonitions though we are not sure how they occur. In contrast to sleep, stupor and coma are states where the ‘arousal’ mechanism seems to fail and may ultimately lead to death. Yet, stupor and coma may not be as dry and colourless as they externally appear. The reporting of large number of NDE (Near Death Experiences) cases raises many interesting issues. Due to advanced resuscitation techniques available today, it is possible to bring back to life subjects who where at the verge of death or ‘technically dead’ for a few moments. A commonality in the reported experiences of these subjects is emerging which usually include having a life-review, traversing a tunnel, encountering a Being of Light, and rarely getting premonitions of the future. What is more important for psychiatry is that these subjects are often reported to have lasting personality changes after being resuscitated. Besides, one may also infer that folklore concepts of ‘Judgment Day’ and ‘angels’ may have arisen from suprasensorial experiences similar to experiences of NDE subjects. A purely mechanistic view-point would dismiss the NDE as a mere organic happening (a temporal lobe phenomenon or something allied or a hallucination) but that does not rule out the interesting fact that a subject in stupor or coma whose ‘arousal’ mechanism is inhibited is still capable of a colourful inner experience that can even result in personality changes once the arousal mechanism is facilitated again. If the NDE is considered something akin to a dream, then also we are left intrigued. If dreams or allied phenomena occur both during sleep (where there is no failure of ‘arousal’) and during coma (where there is a failure of ‘arousal’), then how do we explain the origin of dreams? Do dreams arise from a pre-existing world of dreams that uses the brain as an instrument for expression (just as many mathematicians believe that there is a pre-existing world of numbers which they go on discovering)? Indeed, the whole spectrum of ‘NDE’ experience suggests that in between ‘coma’ and ‘death’, a portion of the individual’s consciousness gets dissociated and traverses ranges of the universal consciousness of which we are not ordinarily aware. The NDE phenomenon raises another question: can a non-material principle of one’s being traverse subtle ranges of consciousness even after brain death? At present our scientific knowledge is too limited to even speculate on this proposition. Yet, it is interesting to note that subjects undergoing anesthesia often report ‘Out of Body Experiences’ (OBE) where a portion of their consciousness seems to get dissociated so that they can report ‘visualizing’ surgical operations being conducted on their own bodies or events that occur at a distance. Another interesting area of consciousness research is the zone of altered states of consciousness. This is not a homogenous zone but seems to reveal that mystical experience can be indicative of a different type of consciousness. Thus, experiments have shown that subjects practicing meditation (like Raj yoga) have certain EEG changes (usually an increase of slow –alpha waves in the frontal and central regions of the brain) along with reduced metabolism. Such physiological changes are not seen in trance states induced through hypnosis, ritualistic dancing and revivalist meetings. Physiological changes during meditation have distinctive characteristics which are different from the neurovascular changes (probably endorphin mediated) accompanying rituals like instances where subjects neither feel pain nor bleed even when they inflict harm on themselves (piercing one’s own tongue or cheek, walking unscathed through fire, lying on a bed of thorns or allied phenomena seen in different cultures).Recently it has been demonstrated that after a month of regular meditative practices, there is an increase in myelination (the protective fatty insulation surrounding nerve fibres) as well as increase in axon density (signifying greater number of brain signaling connections) in the anterior cingulated cortex of the brain that regulates behaviour. This finding could suggest new healing pathways for several mental disorders. So long, we were focusing on the ‘states’ of consciousness modulated through the ascending reticular system that can be in a state of ‘arousal’ or ‘inarousal’. Neurophysiology also studies the ‘contents’ of consciousness like sensations, emotions, images, memories, and ideas. The content of consciousness depends upon structures in the brain, lesions of which can diminish the content while the state of consciousness may or may not be changed. Thus, in the case of a brain tumour, there might be an emotional change (a change in ‘content’) and the subject may later lapse into coma ( a change in ‘state’).In a case of dementia, there might be a diminution of the ‘content’ of consciousness with shrinking of memory and emotional blunting while the ‘state’ of consciousness or arousal remains normal. It is very surprising that even after total bilateral destruction of the cerebral hemispheres, sleeping and waking can still occur in some subjects. The scientists who use the matter-energy approach to understand consciousness also work through different models - physical, biological, quantum, information processing, computational and other allied models. It is claimed that all these approaches have understood the basic workings of consciousness except one area-how can consciousness with its ‘richness’ and ‘variety’ emerge from matter that is inert, inconscient, colourless and dull? Sri Aurobindo points out that one cannot explain the appearance of consciousness out of inanimate matter unless one accepts a Being behind who applies the force and also becomes matter. (Sri Aurobindo, Evening Talks, January 8th, 1940, pg. 701) It is this being who has been experientially perceived as Sachchidananda—a ‘Pure Existent’ who is also Chit or ‘Pure Consciousness’. The problem is how we relate Chit or pure consciousness to the diverse phenomena that science groups under the umbrella of ‘consciousness studies’. Science studies ‘consciousness’ in terms of ‘matter-energy’ or as neurophysiological processes. When spirituality studies consciousness, it uses an intuitive, experiential approach resulting in an absolutist, subjective realization that is not dependent on any objective validation. It is in this way that the spiritual paradigm perceived consciousness as Chit or the ‘pure’ essence of Reality. Thus, spirituality deals with the essence of Reality or Chit that is beyond manifestation. Science deals with the phenomena of consciousness in existence, within the manifestation. As science and spirituality are dealing with two different paradigms of Reality, is there any necessity to integrate them? The problem arises because both science and spirituality use the same term ‘consciousness’ to describe their versions of Reality. It might have been simpler if they had used different terms! The problem persists because Sri Aurobindo is an Integralist. It is his mission to integrate science and spirituality. He is not bothered about the apparent irreconcilability of science and spirituality for He views all problems of existence as problems of harmony. (b) The phenomena of consciousness that works through matter-energy—phenomena that science studies and which spirituality groups under ‘Nature’ or ‘Prakriti’. Sri Aurobindo solves this problem by incorporating ‘Energy’ or ‘Force’ in the very substance of Chit—by placing ‘Force’ as an in-built mechanism within the matrix of Chit. Thus Chit is not merely chit but Chit-Shakti or Conscious-Force. Sri Aurobindo describes ‘CHIT’ to be ‘the universal conscious stuff of existence’ that is manifested in many poises. There is the poise of the mental self-awareness in human beings where the pure action of Chit gets limited; there is the poise of a still limited consciousness in terrestrial forms below the level of human beings in the scale of evolution while at the level of matter, Chit gets so limited that it appears to be inconscient. There are also higher poises (experienced by Yogis and mystics) where Chit can manifest with greater potentialities than in ordinary mentality. The manifestation of ‘Chit’ automatically implies that there is an ‘energy’ or ‘force’ at work. Thus, in the Aurobindonian perspective, consciousness is simultaneously the self-awareness inherent in existence and the conscious-force that builds the universe. Awareness by itself is not enough as there must be a will or ‘Force’ or ‘Executive Energy’ that makes the consciousness effective. As Conscious Force, consciousness is impregnated with and expressive of purpose and meaning at all levels. Thus it is nuclear energy at the level of matter, life in plants, instinct in insects and animals, mental intelligence, will and feeling in human beings, and powers higher than the mind (viz. intuition, revelation) in mystics and yogis. The concept of Chit-Shakti that signifies a movement towards creation initiated in the bosom of an immobile Consciousness brings another dilemna, which Sri Aurobindo has to solve too. Spiritual experience has perceived an ABSOLUTE EXISTENCE BEYOND ALL MANIFESTATION WHICH IS NOT COMPELLED TO MOVE. HOW DOES THIS MOVEMENT ALIEN TO THE ETERNAL REPOSE OF CONSCIOUSNESS COME TO TAKE PLACE IN IT? II.2.8. This that wakes in the sleepers creating desire upon desire, this Purusha, Him they call the Bright One, Him Brahman, Him Immortality, and in Him are all the worlds established: none goes beyond Him. This is That thou sleekest. II.2.13.The One Eternal in the transient, the One consciousness in many conscious beings, who being One orders the desires of many: the calm and strong who behold Him in their self as in a mirror, theirs is eternal peace and ‘tis not for others.